Alan Alda's The Four Seasons is a typically Alda-y trip through comfortable, bourgeois domesticism. It's homey, almost to the point of blandness, and there's nary a plot to be found. But that doesn't necessarily make it unappealing. 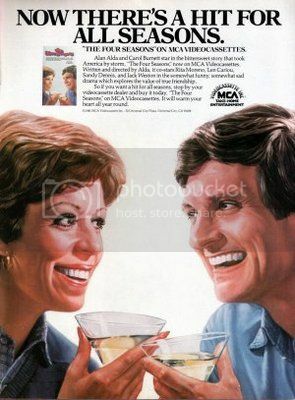 Following three middle-aged married couples (a very sweet Alan Alda and Carol Burnett; Len Cariou and Sandy Dennis; Jack Weston and Rita Moreno) over four vacations (hence the title), the film is mostly about all the tiny quirks and peccadillos that make up very intimate friendships and marriages. The tone of affectionate annoyance is widespread; even as the audience, you feel like you've already lived a life with these people, and you kind of hate them (and love them). The only plot point with any real narrative drive is Nick's (Len Cariou) divorce from his first wife (Sandy Dennis), a spacey, inscrutable photographer, and marriage to his second (Bess Armstrong), a bouncy blonde half his age. Yet even this - a relatively tired tale of midlife crises - is upended by Alda's warm, humane treatment of the characters. As much as they're all neurotic, 1970s Me generationists, they're still three-dimensional and capable of surprise. Indeed, while some of the climactic moments feel like inorganic set pieces for stereotypically Freudian breakthroughs, some were still quite engaging: Bess Armstrong's grief at everyone's resentment, Alan Alda's unexpected meltdown. And the gimmick of seasonal check-ins was nice. That said, another 1970s Alan Alda film does this much better: Same Time Next Year, in which a pair of lovers meet every year for an adulterous tryst, and we live the 50s, 60s and 70s with them. That film had the same amount of cheese, but often felt truer and more urgent.